There is a small square building, an observation or command post (World War Two) located at NGR TF 7408 4506, to the west of a bombing range marker (NHER 26709). Command or observer post. World War Two. Two storeys, rectangular, brick (stamped 'Central, Whittlesea', in remarkably good Flemish bond). One room on each floor with external staircase and roofless annexe. Upper windows have been narrowed. Stands behind dunes and looks over to sea. E. Rose (NAU), 22 April 1982. January 2002. Norfolk NMP. (NGR corrected from original TF 7407 4512). There is a small square building, an observation or command post (World War II) located at NGR TF7408 4506 to the west of a bombing range marker (NHER 26709). This was previously mapped by Suffolk CC, and the aerial photographs used are unknown. However, this building is visible on a range of RAF aerial photographs throughout the 1950s(S1-4). It seems likely that the image used would have been from about 21 March 1952, as this is the date of the photograph used to map the nearby bombing range marker. H. Clare (NMP), 1 May 2002. May-November 2004. Norfolk Rapid Coastal Survey. Context 1048. 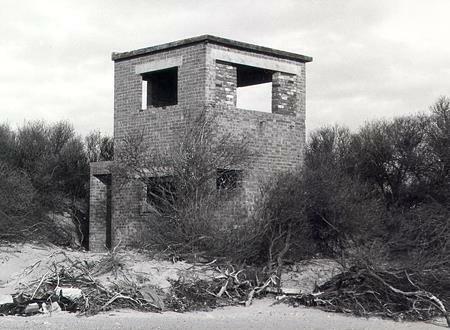 A two storey red brick military observation tower, surrounded by a scatter of building material and modern rubbish, was recorded. It was located between TF 74065 45067 and TF 74087 45065 and situated on the southern side of an area of dunes and the north of the saltmarshes. It probably dates from the World War Two. --- Photograph: Rose, E. (NAU). 1982. BZK 7. <S1> Vertical Aerial Photograph: RAF. 1952. RAF 58/877 (F20) 4027-4026 21-MAY-1952 (NMR). <S2> Vertical Aerial Photograph: RAF. 1955. RAF 82/1277 (F21) 0136-0138 23-AUG-1955 (NMR). <S3> Vertical Aerial Photograph: RAF. 1952. RAF 540/705 (F10) 5057 09-APR-1952 (NMR). <S4> Vertical Aerial Photograph: RAF. 1952. RAF 58/844 5243-5245 21-MAR-1952 (NMR).